Back in September 2011 I wrote a story about nefarious overseas activities involving New Zealand shell companies. The detail stemmed from a cabinet paper from then Commerce Minister Simon Power. 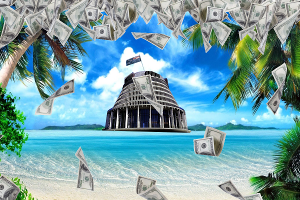 In it Power told his cabinet colleagues that over a four year period 143 NZ registered companies had been implicated in criminal activities overseas such as smuggling, money laundering and tax fraud. Power also said the Reserve Bank believed 1,000 NZ shell companies over three years were used to carry out banking activities free of regulatory oversight and many seemed to be undertaking fraudulent activities. Having previously worked in the same Fairfax office as Mike Field when he was writing about the antics of SP Trading, the NZ shell company that charted a plane to fly 35 tonnes of North Korean weapons to Iran in contravention of United Nations sanctions, I knew NZ had problems with shell companies. But I was surprised by the scale of the problem Power was detailing. Thus an interest developed in reporting on these issues and how the Government set about tackling them. It has been, and continues to be, a fertile source of stories. An online dictionary definition I found describes a shell company as; "A non-trading company used as a vehicle for various financial manoeuvres or kept dormant for future use in some other capacity." Additionally I would add that beneficial ownership of the company is usually hidden. Aside from shell companies, NZ registered building societies, NZ foreign trusts and our Financial Service Providers Register (FSPR) have also thrown up their respective generous helpings of curious and crooked scenarios overseas. NZ foreign trusts, of course, came under international media scrutiny via the Panama Papers. This eventually led to action from the previous National-led government via the Shewan report and plans to remove foreign trusts' tax-free status. The new government also inherits proposals to clean up the FSPR, albeit I believe they'd be better off by simply scrapping the FSPR. But after all this time, and despite attempts to crack down on the misuse of NZ companies, new tales continue to emerge. Over recent months interest.co.nz has reported on the appearance of NZ companies in the so-called Azerbaijani Laundromat, and NZ shell companies caught up in a Slovakian money-laundering probe. The NZ companies involved in these two scenarios were registered some years ago. However, problems have also emerged with more recently registered entities. Witness the activity uncovered by interest.co.nz earlier this year involving associates of infamous company registration service provider Ian Taylor, who with his father Geoffrey, was involved with SP Trading. Ian Taylor, incidentally was this year also linked to a UK-registered company behind the supply of at least £34 million worth of arms to the South Sudanese government. Meanwhile, another recent example of a NZ shell company up to no good overseas is Venus Financial Markets, used in a scam in Malaysia. And just last year there was United Global Holdings - trading name FX United, another NZ company used to rip off Malaysians. Just last week the Ministry of Business, Innovation & Employment (MBIE) trumpeted the fact NZ took top spot, for the second straight year, in the World Bank Doing Business report for ease of doing business. This, MBIE noted, placed NZ ahead of 190 other countries. One of the measures making up the overall ease of doing business ranking is time and cost of starting a business. MBIE points out NZ has been the top ranked country in the world on this measure for the past decade. "For starting a business, for example, New Zealand has the smallest number of procedures required (1) and the shortest time to fulfil them (0.5 days)," the World Bank says. It costs $10, plus GST, to reserve a company name in NZ, and $105, plus GST, to apply to incorporate a company. Of course NZ is not alone with these issues. Of the other countries we like to compare ourselves to, the UK has similar problems. Albeit given its scale, they're bigger than ours. And make no mistake. The oversight of NZ's registered companies, all 595,124 of them as at October 31, is a challenging task. It's hard to imagine everyone who ever attempts to use a NZ company for criminal purposes can be stopped. Nonetheless these issues are damaging to NZ's international reputation. And there are steps that could be taken, and attitudes that could change, to make improvements. In part two of this series we'll delve into this. The map below highlights curious, dodgy and outright criminal overseas activities of NZ companies, financial service providers, building societies and foreign trusts. Hovering your mouse over the red dots on the map will bring up headlines and links through to stories. This map was first used in this story in June 2016, but has been updated with the addition of stories that have emerged since then. The second world map, below, highlights the 83 countries and territories from which the Financial Markets Authority has received enquiries about registered NZ financial service providers. These are also registered NZ companies. Note, hovering your mouse over the red dots on this map won't enable you to click through to stories. However, more detail can be found here. This article was first published in our email for paying subscribers early on Tuesday morning. See here for more details and how to subscribe. Look forward to Part Two. I imagine the recommended remedies and improvements are quite simple - what will be needed is the political will - and hopefully with the change in government it will be there. Simon Power was a disappointing loss to our legislature. I've always thought ease of doing business was a shallow claim to fame, if I were say an international drug dealer, a money launderer, a tax evader, an arms dealer, and wanted to hide some cash, I'd be looking out for a place that was "easy to do business with". Ally that with come one, come all as long as you've got some cash, we won't ask how you got it, as long as there's lots of it - buy our houses, buy our lands with your ill-gotten gains, and it's not a great picture really. I'm being completely non-partisan on this, as I imagine these rorts preceded National as well. Maybe we should head back to some good old regulations, there's a free market and then there's a stolen market. I was seeing reports about this in 2007, 2008. It's well past time that we beefed up the regulation, oversight, and most importantly, enforcement. The international community have been trying to get New Zealand's arse into gear on fixing this for at least a decade. But, but, if we shut down the NZ money laundering rings how are we going to keep Auckland's house prices up?? Yes, it reminds me of a Richie Cunniingham version of Cambodia. Not exactly, you would be looking more for a lack of sensible regulation, oversight and enforcement. The ease of doing business is a cherry but even if we went back to paper forms and had to wait 3 months to complete them it would still be just as good. What actual checks, audits and company tax reviews and punishments do we really have? We cannot even ensure legitimate NZ businesses are working within the rules. Often many don't, and while some do not accidentally, many do not on purpose and when they get caught they go to the media proclaiming but they should be able to break the law on the basis they hire a few people on minimum wage, then they get slapped with a wee fine which will be passed down and away they go again. Ergh. Not even the decency to hire a dodgy accountant like the others or have integrity and keep on top of legal obligations like most out there. But do not fear NZ has been hard at work developing lax regulations in a system that has taken much lobbying and successive governments. Probably why banks also like NZ as well for business. Really nice graph of media sources collection. A clearer reminder about the past few chinks in the armour over the past few years. Oh yeah there was another recent call for dropping business directors addresses being used for registration as the check and regulation was getting to a few companies. I admit it was nice when dealing with one fraudulent company the ability to look up the register quickly to be able to send formal legal documents was a boon. However there are plenty other fraudulent companies advertised by mainstream media who don't even bother to register and do cash jobs, which they want payment through paypal beforehand. Yeah not really enough resources to control all of those right... except the IRD should have been onto them like lightning. What we have is ease of doing crime.